In a large pot, heat oil over medium heat. Add onions and saute until they begin to soften, about 5 minutes. Mix in garlic and cook for another 2 minute. Add tomato paste, cumin, salt, pepper and paprika. Cook for 2 minutes, stirring frequently. Add stock, lentils and carrots. Increase heat and bring to a boil. Once it’s bubbling, reduce heat and simmer for about 30 minutes. Once lentils are cooked through and carrots are fork-tender, remove from heat. Using an immersion blender, puree soup completely. Stir in lemon juice. Taste and adjust seasonings if necessary. Serve topped with a spoonful of dukkah, if desired. Toast all nuts and seeds in separate batches. Reserve 1/2 cup hazelnuts and 1/2 cup pistachios. Combine remaining ingredients in food processor and pulse until finely ground. Pour into a bowl. Add the reserved nuts to the food processor and pulse until just roughly chopped. Mix into the finely ground mixture by hand. 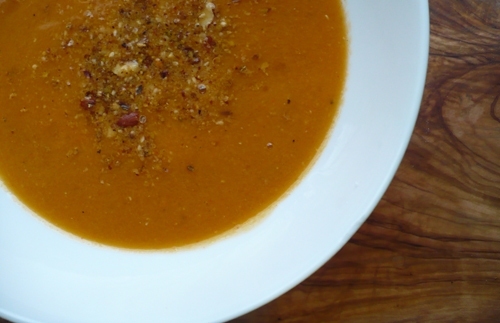 This entry was posted on February 7, 2010 at 12:15 pm and is filed under soup recipes. You can follow any responses to this entry through the RSS 2.0 feed. You can leave a response, or trackback from your own site.